We’re still GLEEfully smiling as the gorgeous Lea Michele was spotted rocking our HOLLY, Asymmetrical Tank Dress yesterday (12.13.13) during her appearance on The Ellen DeGeneres Show. 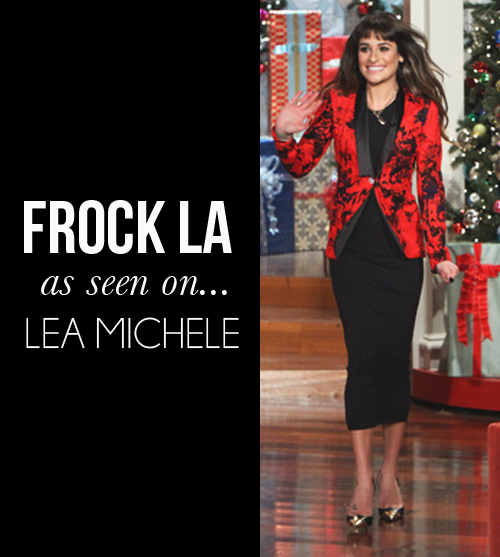 Lea looked incredible as she paired the dress with a printed red blazer, which simply added a “pop” of color that’s perfect for the holidays. Taking a minimal approach with light gold accessories, Lea finished off the ensemble with a pair of two-tone heels. Make Lea’s outfit your perfect solution to any Holiday wear dilemma. Whether you’re attending a party or just want to embrace the spirit of the season, make this look your own and prepare to be the center of attention for any special occasion that may arise. To get you started, take a peak at the image below for some much-needed inspiration. Check out the holly by clicking here. After conversing with Ellen, Lea channeled Audrey Hepburn in Breakfast at Tiffany’s. In just our Holly LBD she performed her new single for the first time, “Cannonball”. Her delivery was as powerful as the lyrics of the song. “I’ll fly, I’ll fly, I’ll fly, like a Cannonball”, we can’t seem to get those words out our head. Thanks Lea!